You’re standing around the water cooler at work, or the single-use coffee machine, and someone starts talking about something they haven’t done or seen “in a dog’s age.” This leads your coworker to rattle off the truism that, for a dog, one year is the equivalent of seven human years. Let’s examine the facts and fictions that underlie the conversion of dog years to human years. We’ll also set out some basic guidelines for how to calculate dog years, or at least to approximate a dog’s age. The notion that dog years vs. human years can be tallied at a ratio of 7:1, where every year of a dog’s life is equivalent to seven of your human years, is a fallacy you continue to hear no matter how often it’s debunked. It’s an old wives’ tale, not dissimilar to believing you shouldn’t cross your eyes or they’ll stick that way, or contort your face and run the risk of your features becoming permanently grotesque. Dog years are not so simple to calculate, because many factors determine a dog’s true age. Among the variables are breed, activity level, size, and general health and stress. From all the information on the subject that I have studied and absorbed, it is also clear that dogs do not age at a fixed rate. Dog years tend to accumulate faster early in a dog’s life, with the rate of aging slowing down and normalizing once the dog reaches adulthood. What are dog years vs. human years? Dog years calculators on the Internet vary when it comes to the first year of a dog’s life. The numbers we’ve seen in our research range from 10.5 up to 18 dog years. The majority settle for something in between; received wisdom currently is that in general, when a dog is 365 days old, he is roughly 15 in human years. That may seem very rapid, but consider that dogs mature at a much quicker rate than we do. This is why the ASPCA recommends having dogs spayed or neutered by the time they are six months old. Dogs reach sexual maturity between six months and two years, depending on the breed. The two most common factors for determining how old a dog is in dog years — by which we mean as measured against the similar age in human years — are size and teeth. 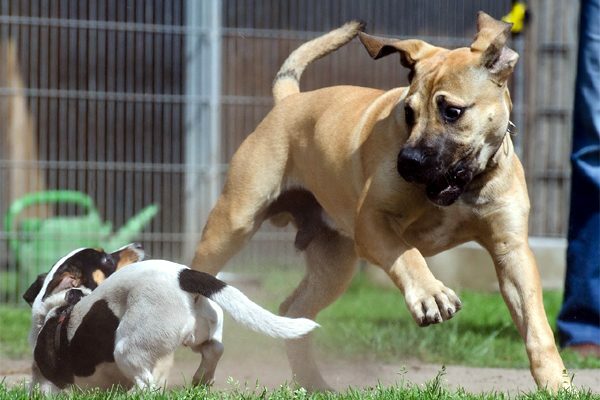 Size is a factor in determining dog years, aging, and lifespan. In these estimations, dogs are grouped into broad size categories, to wit, small, medium, and large dogs. Small dogs tend to have the longest lifespans, so estimations for dog years in small dogs generally see them age slower in dog years. Calculators still show variance when it comes to approximating dog years. At age 14 in human years, the calculators and charts we’ve consulted estimate that small dogs will be 72 to 84 in dog years. A medium-sized dog at 14 human years ranges from 78 to 96 in dog years. Large dogs who have reached 14 human years are 88 to 108 in dog years. The ratios for small dogs are more like 12:1, for medium-sized dogs, 10:1, and for large dogs, 9:1, but even that is only roughly accurate for the first two years of a dog’s life. As you may have guessed, comparing dog years to human years is inexact at best, but these measures for the first couple of years offer more reasonable estimates than the well-worn 7:1 ratio passed down over the ages in the fireside cackling of so-called old wives. The second frequently cited factor in determining a dog’s age in human years is the appearance of a dog’s teeth. Assuming that a dog is well looked after, cared for, and fed properly, the following are rules of thumb. Dental estimates for dog years are based on the number and condition of a dog’s teeth and converted with the same ratios as above to dog years. Once a dog’s teeth have come in, puppies have 28 teeth in total. Fully grown dogs have 42 teeth in total. By the time a dog is seven months of age, all of his permanent teeth will have come in. A dog with a full set of teeth that are still bright white will be in her first or second year, and thus, depending on size, anywhere from 10 to 18 in dog years. Teeth that appear to have some use and yellowing, found in a mouth that exhibits the familiar odor we refer to as “dog breath,” in a fully-grown dog, may indicate an age in human years of three to five. This would put that dog along a spectrum of 29 to 45 years of age in dog years, again, dependent on the dog’s size, breed and overall health. It is much more difficult to estimate an age for an older dog, who may be experiencing tooth decay or missing teeth. With a mouth in that sort of shape, it is generally safe to assume, however, that the dog will be in excess of 10 human years, or between 64 and 80 in dog years, if not older. The condition of a dog’s teeth is a far less precise method for determining dog years than when you have a general marker of human years, along with size, as a basis for your estimate. The post Dog Years to Human Years: An Inexact Science appeared first on Dogster.